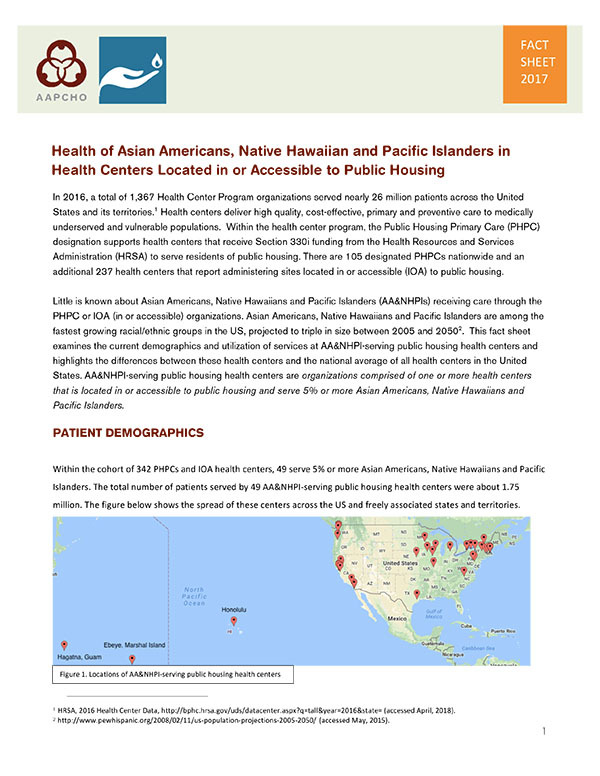 There are more than 80,000 Asian Americans (AAs), Native Hawaiians, and Pacific Islanders (NHPIs) currently receiving care through public housing health centers. Little is known about the geographic density and prevalence of this population as well as their unique health needs, challenges, and potential advantages as public housing residents in access to primary care services. AAPCHO, in partnership with National Nurse-Led Care Consortium (NNCC), developed this resource to help identify the needs and access to care challenges of the growing populations of AAs and NHPIs in public housing. This fact sheet and recording highlight the intersections of housing and health for AA and NHPI populations, including a deeper profile and analysis of the current population of AA and NHPI patients being served in public housing health centers. This resource is targeted for health centers and aimed at improving skills and capacity to meet the needs of vulnerable communities, including residents of public housing.